Navigating the many different types of air conditioners can be cumbersome. Most people are familiar with popular AC types such as window units and central AC systems — but what about mini split units, through the wall ACs, and PTAC units? Here you’ll find all of our air conditioner options sorted by type. 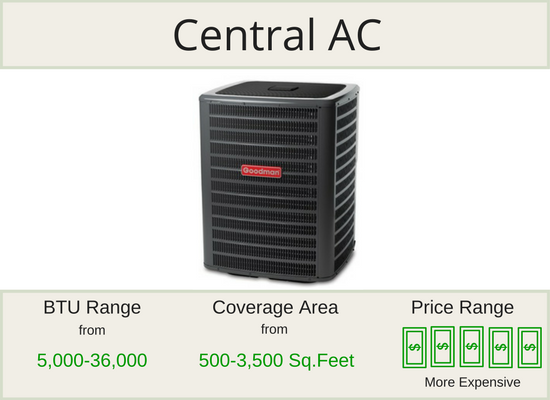 Each air conditioner category features a description of the types of air conditioners along with their respective BTU range, coverage area, and price range. We want to make shopping for your air conditioner as simple as possible. That’s why we offer free shipping on our AC units as well as excellent customer support. Should you have any questions about our products, feel free to reach out to us, and be sure to check out our Air Conditioner Buying Guides & Resources for additional information on how to buy an air conditioner. Mini split air conditioners are energy efficient and quiet. There are heat and cool options available on most models, making them ideal for year-round comfort. Our multi zone mini splits allow you to control the individual temperature of multiple rooms in your home. Inverter technology allows the AC units to scale production up and down depending on the needs of the room, making this type of air conditioner especially energy efficient. Models range from 7,000 to 60,000 BTUs. 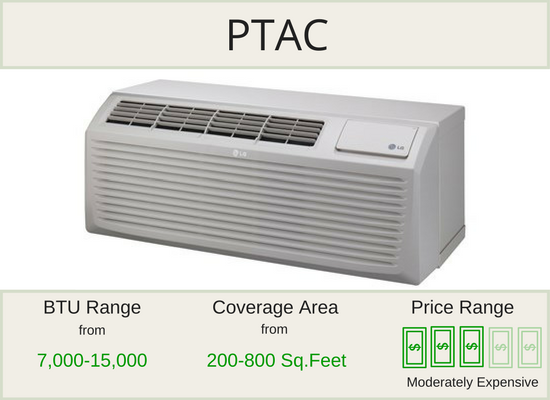 PTAC air conditioners are commercial grade units that feature both heating and cooling. The industry standard size is 42" x 16", and are 220-volt units (265/277 volt units available for commercial use only). You have a choice of 15, 20, or 30 amps, as well as a choice of electric heat or the more energy efficient heat pump. 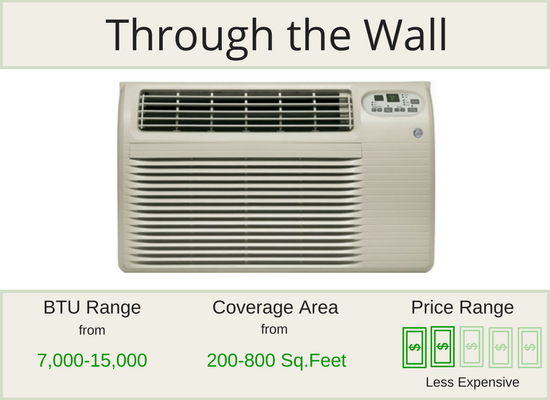 These units are long-lasting with good warranties and range from 7,000 to 15,000 BTUs. This type of air conditioner includes through-the-wall and window options, that combine both heating and cooling power. Models range from 7,000 to 36,000 BTUs. 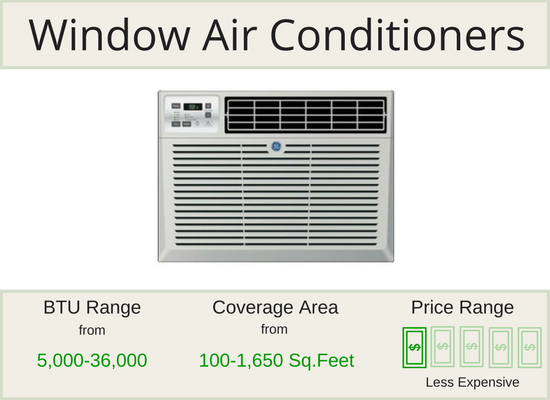 Window air conditioners are inexpensive and easy to install, making them a popular choice for a variety of uses. There are both 115 volt and 220 volt options, with both heat and cool available on some models. Models range from 5,000 to 36,000 BTUs. 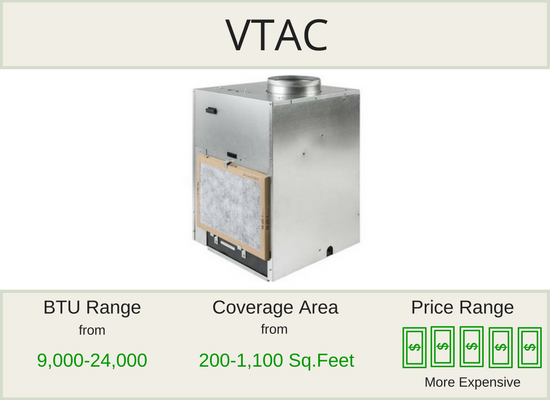 VTAC units are commercial grade air conditioners with heating and cooling. They can be used for one or more rooms and are typically hidden away in a closet. They range from 9,000 to 24,000 BTUs. Through the wall air conditioners are a more permanent solution than window ACs. They usually last longer, too, although replacement is easy. Three standard sleeve sizes are available along with 115 volt or 220 volt options, ranging from 7,000 to 15,000 BTUs. A central AC cools an entire house with one system. Not as efficient as a mini split and requires ductwork. 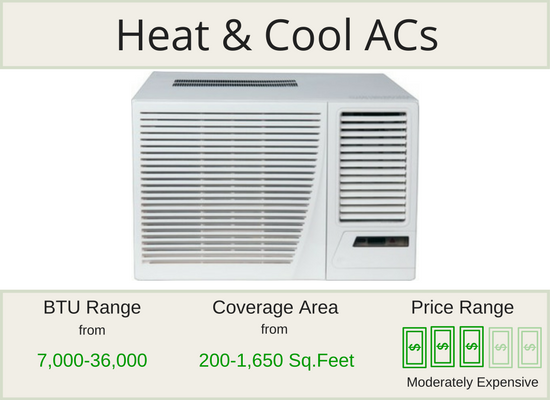 Heat pump units and 2 through 5-ton units are available. 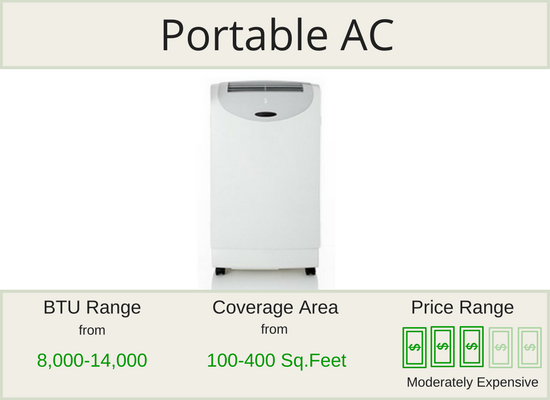 Best as a temporary solution, portable ACs are often loud and inefficient. They need to be vented outside, usually through a window. Some units offer both heating and cooling. They range from 8,000 to 14,000 BTUs. Make sure that you get the correct number of BTUs is very important for your comfort. If you choose a unit that is too large, it will not remove humidity from the air and can damage the compressor. If you choose a unit that is too small it will struggle to work and can significantly shorten the life span of the unit. Our team collaborated with industry experts to put together our BTU calculator. 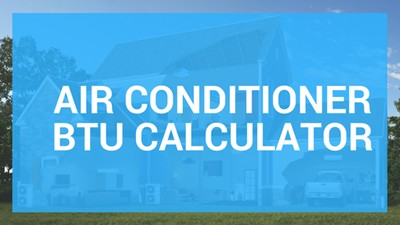 Click Here to use the BTU Calculator. If you have struggled through using window units or having no air conditioning at all it might be time to look for a better option. 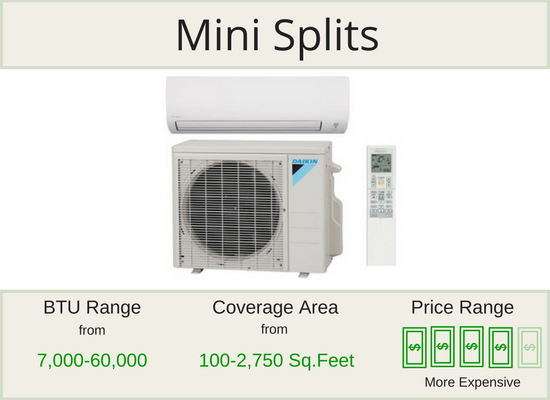 Multi-zone mini splits are a whole home heating and cooling solution that is energy efficient, quiet, and affordable. We put together a guide to get you from learning, to sizing, to buying the perfect setup for you. 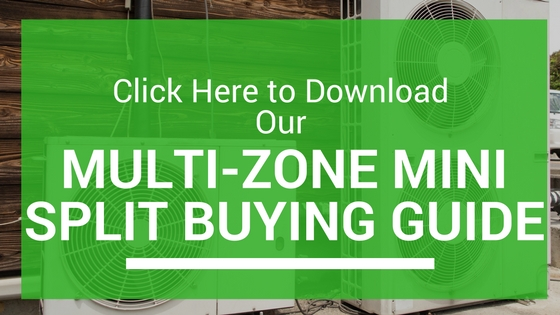 Click Here to get the Multi-zone Mini Split Buying Guide. We specialize in supplying hotels and motels with heating and cooling solutions. We carry all the major brands of PTAC units, Mini Split Air Conditioners, and more. Check out are comprehensive guide on the types of units you need and then fill out our form to get a quote for your property or project.